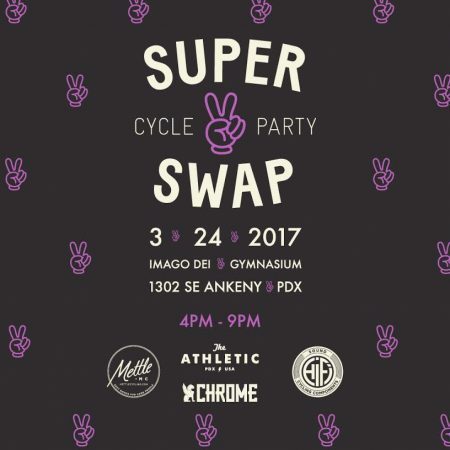 On Friday March 24th, we will once again host the SuperSwap at Imago Dei’s Central City Gym (1400 SE Ankeny Street) from 4pm-9pm. Our last drew over 300 attendees looking to score some sweet deals on awesome product from a variety of vendors. Which is where you come in… We have two ways to participate as a vendor. Either option comes with a turnkey table setup with no setup or breakdown required. Obviously you’re on the hook for bringing your own merch, but we’ll make sure your table is set up an good to go. We have space for a number of vendors. Bike shops, brands, part hoarders, you name it and chances are they’ve participated in the Super Swap. Maybe you’re sitting on a little extra product? Have some seconds, or samples you need to get rid of? Looking to offload that 80’s Moser frame that’s been hanging in your garage? The Time is now. What to expect- People. Lots of people. March feels like a good time to start talking about adventures and getting the right gear ready to do them. Plus, a little beer never hurt anyone. In addition to your exhibiting space, we will be promoting the event and its vendors through our own social channels, customer newsletter, as well as our event-specific account (@CycleSuperSwap on Instagram & Twitter) using #bikesuperswap. Reservations- To reserve the best spot, reserve your table on our website. We are taking payment for the exhibition space in full when you reserve your booth. Space is limited, act quickly to ensure you have a spot! Feel free to forward this message to interested parties. Please route all reservation and event questions to Patrick Croasdaile at the Athletic (service@theathleticcommunity.com).